The PV-Pen game has been an annual tradition on the hill for years. It is a great way to settle the rivalry of the two high schools, but it also brings the whole community together in an exhilarating way. On Friday, October 26, the Palos Verdes Peninsula High School Panthers came to Palos Verdes High School to take on the Sea Kings. Palos Verdes has had a winning streak against Peninsula for nine years. The rivalry is absolutely massive. The two schools share “the hill” and split the students. It has been going on for as long as most students can remember. Fans from both schools filled the stands. 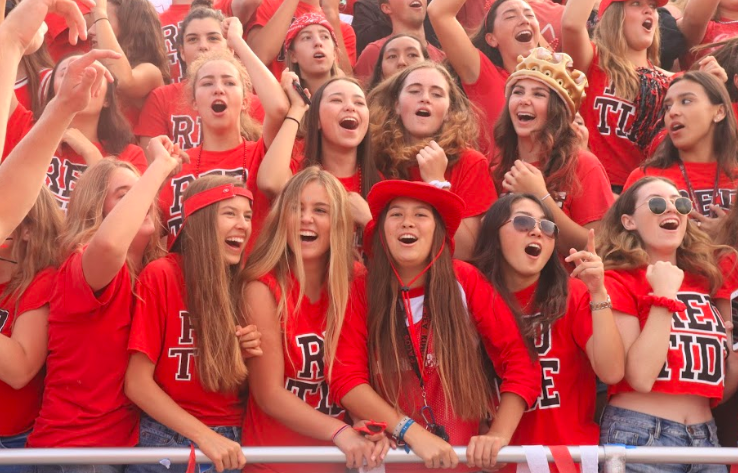 A sea of PVHS students dressed in red cheered loudly, led by their Red Tide captains showing PV had more school spirit. In the beginning of the game Peninsula put up a fight on defense but the Sea Kings eventually got past them. Junior Julian Alessi was able to score a touchdown at the start. By the end of first quarter, PV was winning 7-0. The second quarter PV came out strong scoring another two touchdowns, bringing the score up 21-0. Junior Ryan Wilson scored both touchdowns. At halftime, the PVHS Cheer and Song teams performed along with the Marching Band. The third quarter began with Peninsula coming out ready to fight back. But PV remained strong and prevented their offense from scoring. After getting the ball back, Wilson scored another touchdown bringing the score up 28-0, crushing the Panthers. both teams fought hard but PV easily secured the win with a final score of 28-0. This win gave PVHS its tenth win in a row against Peninsula. Red Tide stormed the field to celebrate the win with the team. Many players and fans jumped into the pool, including principal Dr. Allan Tyner.